Even though Watershed moved to Buckhead more than a year ago, reinventing itself in a more polished milieu, I doubt I’m the only one who had trouble picturing another restaurant in its original Decatur location, a converted gas station with walls painted a soothing shade of celery. What new venture could possibly reboot the space? 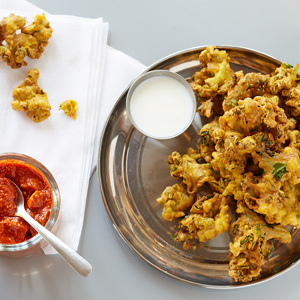 The answer came in March in a blast of colors and spices, when Meherwan and Molly Irani imported a second location of their Asheville, North Carolina, sensation, serving playful riffs on Indian-style street snacks. Bye-bye, soothing celery; hello, racy scarlet. Their food is made for sharing. Pile your plates full of wispy okra fries, bhel puri (puffed rice and other crisp tidbits tossed with onions and cilantro and lashed with chutneys), samosas, and crunchy kale pakoras. Featured curries on the vegetarian and non-veg thali platters change daily. If you find it’s a dish typical for the average Indian restaurant, like saag paneer, skip it. If it’s a chicken and peanut curry from the Andhra Pradesh region or a coconut-rich Goan fish curry, pounce. I tend to most avidly champion Indian restaurants that uphold authentic-minded cooking, but it’s mighty hard to feel sanctimonious when I’m stuffing my face full of Bombay chili cheese fries smothered in spiced lamb hash. This article originally appeared in our September 2013 issue.